Following celebrations to mark 10 years of RUFORUM, the next phase of RUFORUM’s evolution is being mapped out in a new Strategic Business Plan (SBP 2015-2020). The SPB highlights the key directions that RUFORUM will take in the next five years, including the modalities for engagement in Continental agenda especially Science, Technology and Innovation Strategy for Africa (STISA 2026), the Comprehensive African Agricultural Development Program (CAADP) and Science for African Agriculture (S3A). During the Khartoum meeting held at Rotana Hotel 8-10 June, 2015, Sixty Five (65) Deans and Principals from 22 African countries had the opportunity to meet and deliberate on the future direction of RUFORUM and Agricultural Higher Education in Africa. This event gave opportunity to the two universities that hosted the meeting, i.e., University of Gezira and University of Kordofan and Agricultural Research Corporation (ARC), Sudan to showcase potential areas of partnerships, collaboration and importantly demonstrated how their Universities and ARC are linking with Communities and Agri-business. 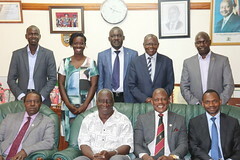 During the meeting, it was announced that the Annual Meeting of the RUFORUM 46 Vice Chancellors will take place in Windhoek, Namibia 28 and 29 August, 2015. The meeting will be hosted by the University of Namibia.